The mysterious Stonehenge was a dance arena for ancient revellers listening to 'trance-style' music, according to one professor who is an expert in sound. Stonehenge has baffled archaeologists who have argued for decades over the stone circle's 5,000-year history - but now academic Dr Rupert Till believes he has solved the riddle by suggesting it may have been used for ancient raves. Part-time DJ Dr Till, an expert in acoustics and music technology at Huddersfield University, believes the standing stones of Stonehenge had the ideal acoustics to amplify a 'repetitive trance rhythm' not dissimilar to some kinds of modern trance music. The original Stonehenge probably had a 'very pleasant, almost concert-like acoustic' that our ancestors slowly perfected over many generations. 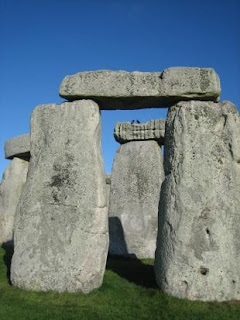 Because Stonehenge itself is partially collapsed, Dr Till, used a computer model to conduct experiments in sound. He said: 'We were able to get some interesting results when we visited the replica by using computer-based acoustic analysis software, a 3D soundfield microphone, a dodecahedronic (12-faced) speaker, and a huge bass speaker. 'We have also been able to reproduce the sound of someone speaking or clapping in Stonehenge 5,000 years ago. 'The most interesting thing is we managed to get the whole space (at Maryhill) to resonate, almost like a wine glass will ring if you run a finger round it. 'There are two main theories about what Stonehenge was used for,' he says. 'One is that it was a healing space, the other that it was a place of the dead. 'Both of these imply ritual activity, but very little is actually known about the way people sang, danced or performed rituals there because these things left no trace in the archaeological record. 'However, our research shows that there are particular spots in the site that produce unusual particular acoustic effects, intimating that perhaps a priest or a shaman may have stood there, leading the ritual. 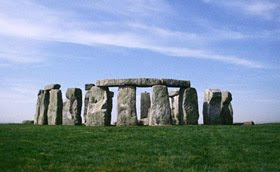 The data is still being analysed, but it is clear that Stonehenge did have a 'very unusual sound' says Dr Till. 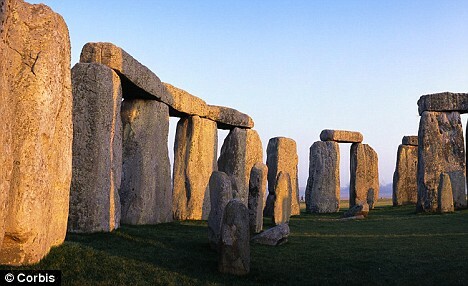 Stonehenge has been voted as the UK’s top wonder in a new list of the country's unmissable attractions. The ancient site beat competition from other notable UK landmarks including Snowdonia and Edinburgh Castle to top the survey of the 'Seven Wonders of Britain'. The survey also found that while a third of 18-24-year-olds said fish and chips on the pier was the most memorable British holiday activity, over 35-year-olds were wowed by the UK's countryside and scenery. strong belief that Stonehenge is an iconic part of our heritage." 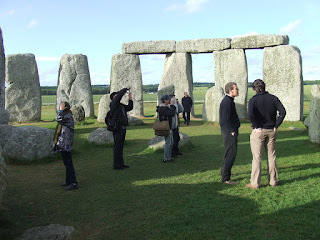 Stonehenge Special Access Tours - Go beyond the fences! We have arranged with English Heritage for you to experience a unique guided visit to this ancient sacred site - beyond the fences and after the crowds have gone home. Walk amongst the stones and experience the magical atmosphere within the inner circle. For those of you who have not visited this sacred site, we should mention that the complex is roped off. Visitors observe the stones from a distance and are not permitted within the temple complex..........our special access tours allow you to be amongst the stones and to actually touch them. Your guide will bring to life its many myths, legends and rich and fascinating history. All tours depart central London at 6.00am and return mid-day leaving you time to make the most of your stay in London. Labels: Stonehenge special access tours - touch the stones. It was a technological innovation from a people way ahead of their time, as explained by the little-known inscription: "Someday we will be able to use this to receive something called 'satellite TV' for free." 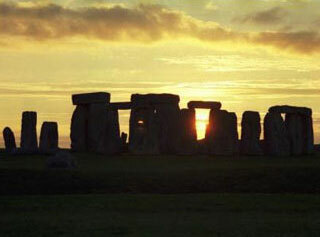 Stories that `explain' Stonehenge have been told since the Middle Ages. 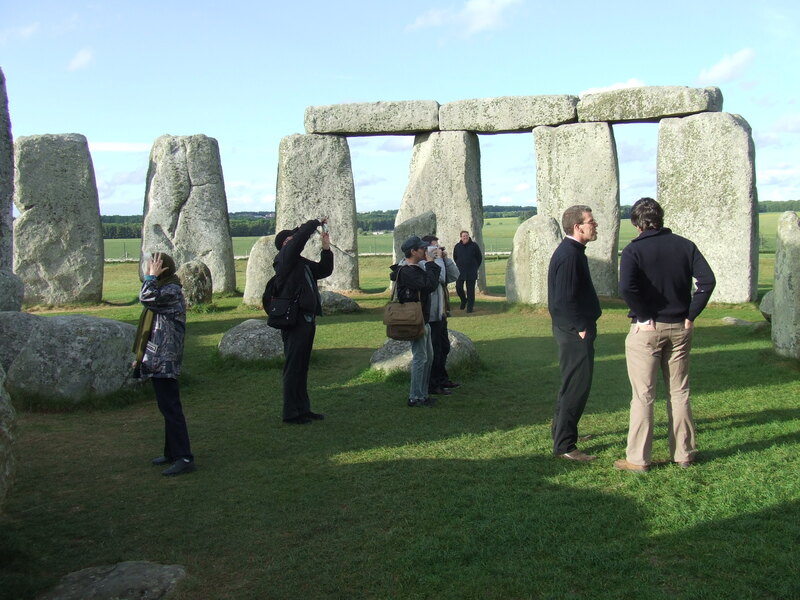 People have tried to explain Stonehenge for centuries - certainly since the Middle Ages. The monument probably takes its name from Old English stan hengen - `the stone hanging (- places)', suggesting it could perhaps have been an Anglo-Saxon execution site. But no excavation there has located one of those pathetic, contorted burials that so graphically illustrate early medieval royal control (see BA, February). Although Domesday Book shows that Stonehenge was on a royal estate, it was not the meeting-place of the local hundred court. Nor is it close to a boundary, and although roads went close by, it was not at a crossroads. So it was probably not an Anglo-Saxon `killing-place'; but people who saw in the stone trilithons a similarity to the two-post and crossbeam gallows typical of the period may have given the monument its macabre name - England's first example of gallows humour? 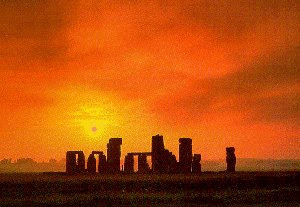 Any joke was lost on Henry of Huntingdon, the author of the work in which Stonehenge is first recorded, for the early copies of his book spelt it stanenges, perhaps because he took the name from an h-dropping Wiltshire native. The section of his History of the English that mentions Stonehenge was issued c. 1130, and it is quite likely that Henry had seen Stonehenge, for he gives an eye-witness account: `stones of remarkable size are raised up like gates, in such a way that gates seem to be placed on top of gates' - a graphic description of how the lintels of the outer sarsen circle are overtopped by the central trilithons. Henry regarded the monument as one of England's marvels: `no-one can work out how the stones were so skilfully lifted up to such a height, or why they were erected there'. He was soon to be given an explanation, however. Geoffrey of Monmouth's History of the Kings of Britain of c 1136 claimed that Merlin had the stones brought from Ireland and re-erected, using his `wondrous art' at the behest of his British patron. Twelfth century writers understood patronage, and their Histories reflected contemporary tensions by offering legitimisation variously to Normans, English, or Welsh. Henry accepted Geoffrey's story, but many others since have not, doubting the existence of the `old book' that he claimed was his main source. He must have had some source other than Henry, however, as he put the `h' in his spelling of Stonehenge. But what he says about the monument does not suggest that he had ever seen it; he seems to have thought it a single ring, and makes no mention of the lintel-stones. If he had known the area better, he would not have described Amesbury, beside the Avon, as a mons (`mountain'). Stories to `explain' landscape features were probably told often enough; `the tendency of fiction to gather round places and place-names', as the historian Patrick Sims-Williams wrote in a study of their use (or uselessness) in understanding the Anglo-Saxon settlement. One area for which much has been claimed is Uffington, where the long barrow Wayland's Smithy is recorded in a 10th century charter, and where other names around the White Horse, such as the Ring Pit, may seek to locate the exploits of Wayland, the mythical smith. Barrows, recognised as ancient burial places, were particularly likely to acquire heroic names. But in general the boundary marks in Anglo-Saxon charters are boringly prosaic. The circuit of an estate close to Stonehenge went `from the Avon to the old camp ditch . . . to the track . . . to the boundary that Wulfsige laid down', recognising previous use of the land with its reference to an Iron Age or Roman enclosure but not giving it a fabulous origin. Ownership rights are stressed by the reference to Wulfsige. Heroes, giants and gods are allowed an occasional place, but overall the landscape is viewed as parcels of property. Local people may have told stories about Stonehenge, but the monument's name does not suggest anything but some grim tale about an execution - or it may just be a nickname. It can only be said that, from archaeological evidence, medieval people seem not in fact to have used the place at all. It was what Henry of Huntingdon said, a marvel, but it had no role to play in the medieval landscape of managed, demarcated downland, where the king's sheep grazed under the watchful eyes of their shepherds. Superb interactive 'full screen' panoramic image of Stonehenge. Drag the picture with the mouse or use the cursor keys to rotate the view - use Shift and Control to zoom in and out. Can you spot the magical bluestones, transported 250km from Wales by our Neolithic ancestors? Professors Darvill and Wainwright believe they hold the key to unlocking one of archaeology's biggest mysteries - the purpose of Stonehenge. Just completed a great tour of Stonehenge with a fantastic group of travellers (see image) We did a special access tour - beyond the fences after the crowds have gone home (the best way by far) Today we did my classic itinerary, see below. Visit the beautiful medieval city of Salisbury and explore the magnificent Cathedral crowned with the tallest spire in Britain and built by medieval craftsmen over 750 years ago. See one of the few surviving original texts of the Magna Carta and wander around the picturesque streets of this ancient market town. Afterwards,we visit Old Sarum Castle (Old Salisbury), one of Britain's earliest settlements. First occupied over 5000 years ago, its been occupied and defended in turn by the Romans, Saxons and Normans and it was the site of the original city and cathedral. Explore the ruins of this once thriving city in their ancient and beautiful setting, and enjoy spectacular views over the sweeping landscape of Salisbury Plain. 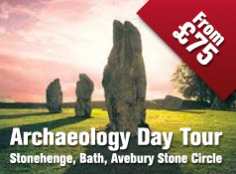 charming village of Avebury with its thatched cottages, antiques and village church - and maybe enjoy a cream tea.We also see Silbury Hill, Europe's largest prehistoric man-made monument yet forever a mystery, before returning back to the present - London. A truly legendary day out in the ancient Kingdom of Wessex ! 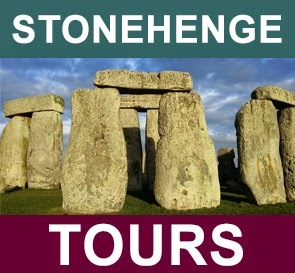 I operate private tours all year round - please contact me if you want a 'proper' tour of Stonehenge. This is not an advert! (search online to buy a copy - Lulu.com or Amazon will sell it. I have just finished this book and can highly recommend it. 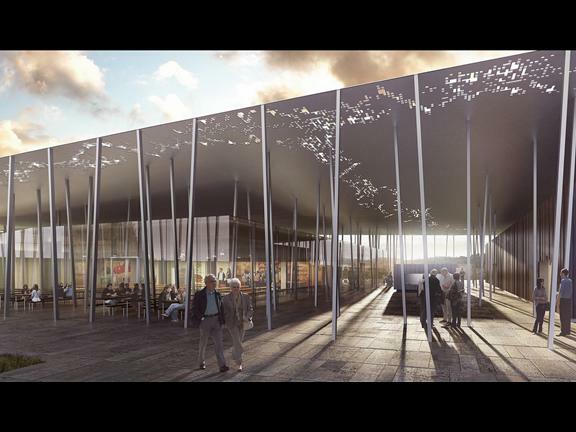 The designs were unveiled as a planning application for the visitor centre on the Airman’s Corner plot – along with an application to close the A344 that runs next to the Stones – was made to Wiltshire Council. The scheme features a perforated undulating canopy, supported by a forest of thin columns, which sits ‘lightly in the landscape above a pair of self-contained pods’ on a limestone pavement. The transparent, glazed box will house a shop and a café while the other solid ‘pod’ - clad in locally sourced chestnut wood - will be home to the exhibition space (click here to see early sketches). DCM landed the contest to design the new facility back in February – effectively for a second time following the demise of its original £65 million proposals in 2007 – seeing off Bennetts Associates and Edward Cullinan Architects in the process. Stephen Quinlan, director of architects’ Denton Corker Marshall, said: ‘Designing a visitor centre at a site of such importance is both a major challenge and a serious responsibility. Our proposal, above all, seeks not to compromise the solidity and timelessness of the Stones, but to satisfy the brief with a design which is universally accessible, environmentally sensitive, and at the same time appears almost transitory in nature. He added: ‘If once back at home, a visitor can remember their visit to the stones but can’t remember the visitor centre they passed through on the way, we will be happy. Speaking to the AJ, Quinlan admitted the practice, which has a six-strong team working on the scheme, almost didn’t enter the second contest. However the London-based director decided to have another crack partly to counter accusations of ‘sour grapes’ following the demise of the practice’s original, sub-terranean proposals [on a different plot to the North East of the Stones]. The long-running visitor centre project has been rumbling since 1986 and is set to be funded by English Heritage (EH), Highways Agency, Department for Culture, Media and Sport, the Department for Transport and the Heritage Lottery Fund (HLF). EH told the AJ that it had factored in the possibility of a public enquiry into its timescale but still hopes the centre will be open in time for London’s Olympic Games in 2012. The total budget for the scheme, including roadworks, is £27.5 million. This is the text of the historic appeal launched by the Stonehenge Protection Committee and the National Trust in the 1920s to save Stonehenge. Please note that this is not an ongoing appeal. The Stonehenge Alliance will be very pleased to hear from you if you'd like to make a donation towards their current campaign to protect the monument. Click here for more details. Note: We have added the bold emphasis to draw attention to inconsistencies between the National Trust's highly commendable attitude 80 years ago and the British government's determination to bulldoze a road through the World Heritage Site today. We have added the strike through emphasis to stop people accidentally donating money by mistake. We are glad to be able to state that options have just been secured for the purchase of an area of the Plain which includes the whole of what may be called "the Stonehenge sky-line." Should the purchases be effected, the Air Force buildings will be removed, further building will be prevented, and the valuable archeological remains of the site permanently protected from the plough. That the leaders of all political parties should unite in appealing for such a cause is not surprising. 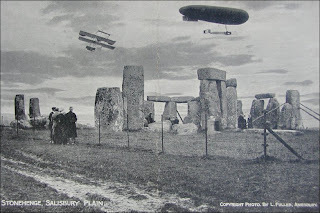 Salisbury Plain is the greatest of our archeological sites, and Stonehenge, a mysterious legacy from the dim beginnings of our civilization many centuries before the Romans came, is the heart of the Plain. Causes-and good causes- are appealed for every day, and it is evident that not everything worth "saving" can be "saved." But we have not two Stonehenges, and our generation will be vilified by all posterity if we allow the surroundings of this monument, the frontispiece to English history, to be ruined beyond repair. LONDON — The discovery of a small prehistoric circle of stones near Stonehenge may confirm the theory that the mysterious monument in southwest England was part of a massive funeral complex built around a river, researchers said Tuesday. The new find shows that the second stone circle — dubbed "Bluehenge" because it was built with bluestones — once stood next to the River Avon about 1.75 miles from Stonehenge, one of Britain's best loved and least understood landmarks. 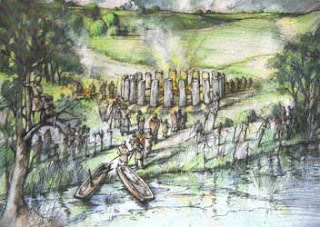 The find last month could help prove that the Avon linked a "domain of the dead" — made up of Stonehenge and Bluehenge — with an upstream "domain of the living" known as Durrington Wells, a monument where extensive signs of feasting and other human activity were found, said Professor Julian Thomas, co-director of the Stonehenge Riverside Project. Project director Mike Parker Pearson said it is possible that Bluehenge was the starting point of a processional walk that began at the river and ended at Stonehenge, the site of a large prehistoric cemetery. "Not many people know that Stonehenge was Britain's largest burial ground at that time," he said. "Maybe the bluestone circle is where people were cremated before their ashes were buried at Stonehenge itself." There were very few signs of human life found around Stonehenge and Bluehenge, researchers said, lending credence to the idea that it was used as a funeral site, especially since there were signs that many human beings were cremated there. A five-university team has been excavating the greater Stonehenge site since 2003 in a bid to unravel its meaning and use. "This find certainly confirms the idea we've put forward that the river is of fundamental importance and links everything," Thomas said. "Everything is related to the river. That suggests that even before Neolithic time it may have had spiritual or religious significance. This find enhances the idea that all the monuments in this landscape are linked in various ways." Researchers did not find the actual stones used to mark the smaller circle found by the river, but they did find holes left behind when the stones were removed. 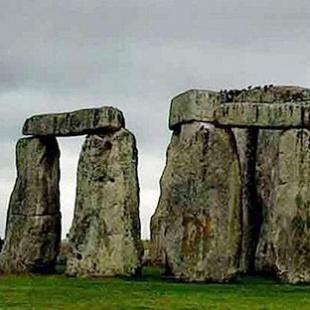 The scientists believe the massive stones used for Bluehenge were dragged from the Welsh mountains roughly 150 miles away. There were clear indications that the gigantic stones from the Bluehenge site were later removed whole for use in the construction of Stonehenge, Thomas said. 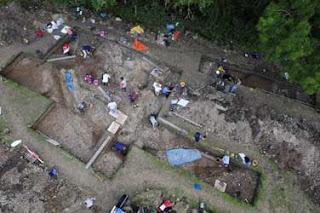 They hope to use radiocarbon dating techniques to better pinpoint construction dates. Stonehenge, a UNESCO World Heritage site, is a favorite with visitors from throughout the world and has become popular with Druids, neo-Pagans and New Agers who attach mystical significance to the strangely-shaped circle of stones, but there remains great debate about the actual purpose of the structure. Rare excavation work at the actual Stonehenge site was begun last year in a coordinated effort to unearth materials that could be used to establish a firm date for when the first set of bluestones was put in place there. 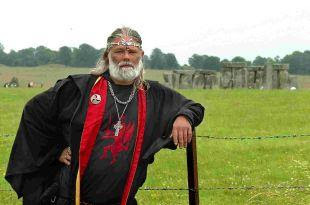 Arthur Pendragon at Stonehenge - keep up the good work! I was up at Stonehenge yesterday and had the pleasure of meeting Arthur Pendragon. If you intend to vist the site please make sure you stop and support his cause. He has got 1000's of signatures (from 60 different religions). You can always emasil your comments directly to him - see below. THE "grave robbers", sorry archaeologists, have been back this summer, theorising and arguing over the whys and wherefores of Stonehenge, and our televisions focus on how marvellous the ancients were who created it. Well, after spending £37 million and taking 11 years over public consultation and inquiry, our Government, like a petulant child, ignored all the findings and dismissed with the stroke of a pen all plans for road improvements in and around Stonehenge and forced English Heritage, the Government's own watchdog looking after our national monuments, to begin anew with plans and public consultations. It has been described as "a step in the right direction…" by Robert Key, the Conservative MP for Salisbury. But I say it is a step backwards... back to square one. So what now? More rounds of talking shops and the inevitable "gravy train" of jobs for the boys, with English Heritage doing all it can to turn Stonehenge into a third-rate theme park with a visitor centre, cafe and all the other franchises and marketing practices that this entails. The quicker they do something about the Stonehenge visitor experience the better - lives are put at danger every day at Stonehenge. At least put a zebra crossing there. Condolences to the womans family. Sorry, I cant always post good news? AN American woman on holiday in the UK has died after being hit by a car crossing the road near Stonehenge. The woman, who has not been named, was crossing the A344 at Stonehenge at 7.12pm yesterday when she was hit by a green Toyota RAV4, which was travelling from Amesbury towards Shrewton. She sustained multiple injuries and was pronounced dead at Salisbury District Hospital. Archaeologists have discovered Stonehenge's little sister, dubbed Bluestonehenge, just 2.8km away on the west bank of the River Avon. The site, once made up of 25 blue Preseli stones - hence it's nickname - was constructed about 5,000 years ago. According to archaeologists from the Stonehenge Riverside Project, Bluestonehenge linked the 'domain of the dead' to that of the living at Durrington Walls further upstream, with the River Avon being the vital link between the two. Director of the project, Professor Mike Parker Pearson from the Department of Archaeology at the University of Sheffield, said: "It could be that Bluestonehenge was where the dead began their final journey to Stonehenge - Britain's largest burial ground at that time. 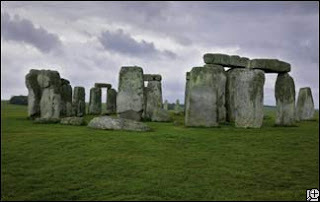 Maybe the bluestone circle is where people were cremated before their ashes were buried at Stonehenge itself." The stones at Bluestonehenge were dragged 150 miles from the Welsh mountains and set in a circle measuring 10m in diameter and surrounded by a ditch with an external bank - the henge. The outer henge was built c.2400 BC but arrowheads found in the stone circle suggest the stones were put up as much as 500 years earlier. It appears the stones were removed sometime during the Neolithic era, and some were then used up the road at Stonehenge when it underwent a major rebuild c.2500 BC. Archaeologists know that after this date Stonehenge consisted of about 80 Welsh stones and 83 local, sarsen stones so maybe some of the stones now standing at the centre of Stonehenge once stood on the banks of the River Avon. Tests to obtain radiocarbon dates from pickaxes made from deer antlers found at Bluestonehenge will give a more accurate picture of the sequence of events. Dr Josh Pollard, co-director from the University of Bristol explained: "The newly discovered circle and henge should be considered an integral part of Stonehenge rather than a separate monument, and it offers tremendous insight into the history of its famous neighbour. Its landscape location demonstrates once again the importance of the River Avon in Neolithic funerary rites and ceremonies." Prof. Julian Thomas, co-director, added: "The implications of this discovery are immense. It is compelling evidence that this stretch of the River Avon was central to the religious lives of the people who built Stonehenge. Old theories about Stonehenge that do not explain the evident significance of the river will have to be re-thought." A clear out at Salisbury District Council’s Planning Office has uncovered a long lost Neolithic document, which experts say, ‘finally explains the purpose of Stonehenge’. After weeks of careful study by a team of Oxford University archaeologists – where the fragile deer hide document had be taken for radio carbon dating and translation – it was revealed today that the document is in fact a 5000-year-old failed planning application for the Stonehenge site. Contrary to the widely accepted theory that Stonehenge was a place of pagan worship, which had been designed and built to act as some sort of giant celestial calendar – instead, the document details the henge’s intended use – that of a vast covered market place. 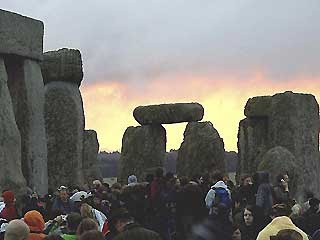 Dr Amy Bogaard, lecturer in Neolithic and Bronze Age Archaeology at Oxford, explained, ‘Stonehenge was to be a place where local merchants and tradesmen could gather, in order to peddle their wares and services to the thousands of Bronze Age tribes people who occupied Salisbury Plain at the time’. The document includes a plan, which shows that originally 600 stalls were to be constructed over a 200 acre site that would have also boasted ample grazing for 3500 Oxen and cart. ‘Stonehenge was essentially going to be the world’s first out of town shopping centre,’ said Dr. Bogaard. ‘This is an amazing find that not only answers all of the questions we had regarding what Stonehenge was for and why it was built, but also gives us a fantastic insight into the day-to-day life of Bronze Age Britons, their beliefs, their values and their culture,’ Dr. Bogaard continued. 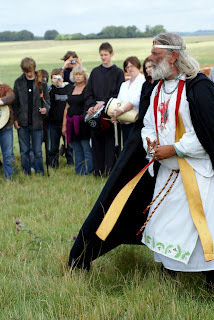 ‘For example, we now know that Druidism is not a pagan religion at all. 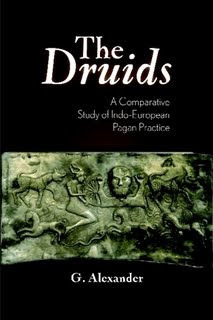 ‘Druids’ was actually the brand name of a chain of prehistoric pharmacists, the forerunner of their modern day counterpart ‘Boots’,’ she concluded. This short film shows the landscape around Stonehenge as recorded by LIDAR survey (airborne 3D scanning). Millions of measurements were taken across the landscape, and here they have been turned into a 'solid' computer model to show how well the archaeology is recorded by this method. Prehistoric burial mounds (barrows), the great Cursus (a 2km Neolithic monument), the Bronze Age Avenue which links Stonehenge to the River Avon, and other henges such as Woodhenge and Durrington Walls are all clearly visible. Labels: Stonehenge 3d video - wow. The new find shows that the second stone circle -- dubbed "Bluehenge" because it was built with bluestones -- once stood next to the River Avon about 1.75 miles (2.8 kilometers) from Stonehenge, one of Britain's best loved and least understood landmarks. The find last month could help prove that the Avon linked a "domain of the dead" -- made up of Stonehenge and Bluehenge -- with an upstream "domain of the living" known as Durrington Wells, a monument where extensive signs of feasting and other human activity were found, said Professor Julian Thomas, co-director of the Stonehenge Riverside Project. The scientists believe the massive stones used for Bluehenge were dragged from the Welsh mountains roughly 150 miles (240 kilometers) away. 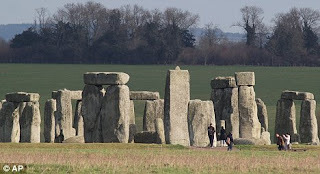 There were clear indications that the gigantic stones from the Bluehenge site were later removed whole for use in the construction of Stonehenge, Thomas said. Labels: Megalithic mytery - 21st Century answer. THE origins and purpose of Stonehenge have always been shrouded in mystery and now the ancient monument has made it on to a list of things Britons find most confusing. A DRUID protester is calling for remains taken from the Stonehenge World Heritage site to be returned - and has collected thousands of signatures on a petition backing his call. King Arthur Pendragon says to take the ancient remains permanently away from, what was intended to be, their final resting place would be undignified and should not be allowed. He said: “There is no dignity left if they can just take them away and not care they were living, talking human beings at one stage. The remains were removed from the site last year for tests to be carried out as part of The Stonehenge Riverside Archaeological Project. The project, supported by National Geographic under the leadership of Professor Mike Parker Pearson of the University of Sheffield, led to new insights into the possible uses of the site. Radiocarbon dating of human cremation burials at the ancient monument suggested it was used as a cemetery from its inception just after 3000BC until well after the large stones went up around 2500BC. 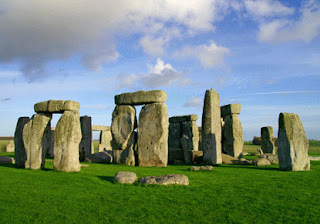 Many archaeologists previously believed people had been buried at Stonehenge only between 2700 and 2600BC, before the large Sarsen stones were raised and the new dates provide strong clues about the original purpose of the monument. But the Druids say they will not rest until the remains have been once again laid to rest. A spokesman for English Heritage, which manages the site, said permission to excavate is only granted when the applicant can show the benefits in the increased knowledge are likely to outweigh the damage done by the work and that excavation of human remains is regulated under the Burial Act. The spokesman said: “Scheduled monument consent was duly granted early in 2008, with appropriate conditions to safeguard the site and ensure what was found was appropriately studied,published and deposited in a museum. PLANS have been submitted for the long awaited new visitor centre for Stonehenge. English Heritage has now submitted a planning application for the centre, which will be located one-and-a-half miles from the monument. It has been designed to blend in with its surroundings, and the centre will not be visible from the stones themselves. The exhibitions, café, shop and toilets will be housed in a pair of single-storey areas – one glass, the other timber-enclosed - sitting beneath a gently undulating roof. The centre will be linked to the Stones by a low-key transit system. 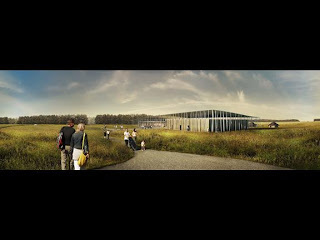 English Heritage’s Stonehenge project director Loraine Knowles said: “The new centre is designed to blend into the World Heritage landscape which visitors will pass through on their way to the Stones. “It will provide enhanced opportunities for education and interpretation, and have first class facilities in keeping with Stonehenge’s status as a world-renowned tourist attraction.” Wiltshire Council will now undertake further public consultation as part of the formal planning process. Further details of the application are available from Wiltshire Council. Alongside the planning application, English Heritage is supporting Wiltshire Council with their proposals for a Traffic Regulation Order restricting motorised traffic on the A344. Labels: Picture of new visitor centre ? Look like an air craft hanger to me ? PLANS for a new visitors’ centre for Stonehenge have been unveiled. Stephen Quinlan, director of architects’ Denton Corker Marshall, said: “Designing a visitor centre at a site of such importance is both a major challenge and a serious responsibility. Our proposal, above all, seeks not to compromise the solidity and timelessness of the Stones, but to satisfy the brief with a design which is universally accessible, environmentally sensitive, and at the same time appears almost transitory in nature. Wiltshire Council will now undertake further public consultation as part of the formal planning process. Further details of the application are available from Wiltshire Council. Alongside the planning application, English Heritage is supporting Wiltshire Council with their proposals for a Traffic Regulation Order restricting motorised traffic on the A344.